With portable gadgetry dominating the IFA 2012 mindshare, Asus is bucking the trend with some heavy duty, high end PC kit including a desktop rig and a pair of monitors. 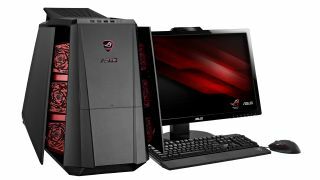 The desktop beast is the ROG TYTAN CG8890, a money-no-object affair aimed at gamers. It's a range-topping Intel Core i7-3960X six-core processor does the heavy lifting at speeds up to 4.2GHz. Graphics grunt, meanwhile, takes the form of the unparalleled NVIDIA GeForce GTX 690, the fastest 3D card in Christendom. Or anywhere else, for that matter. To sweeten the deal, Asus has chucked in its Xonar DX sound card for smooth sounds, along with dual 128GB SSDs in speedy RAID0 config. And get this. The CG8890 has an aerodynamic polygonal exterior that transforms when overclocked while the additional DEFCON and bottom grill lighting indicator shows system readiness with blue and red LED lights. Yeah, baby. Moving on to monitors, the ASUS Designo MX279H and ASUS Designo MX239H come in at 27-inches and 23-inches respectively and stick with the premium theme by combining pricey IPS panels with ultra-slim bezels and "sundial-inspired" stands. Details are currently slim on the ground, but we're thinking 2560 x 1440 pixels for the 27-inch model and 1920 x 1080 for the 23-incher. No word on refresh, but it's unlikely to be anything more exotic than 60Hz. Dual HDMI inputs cover the connectivity (we'd prefer to see some DVI ports, too) while luxury audio experts Bang&Olufsen have been drafted in to sort the sound. Finally, Asus is also rolling out a new portable beamer, the Asus B1 Portable LED Projector. It's a 500 lumens LED-powered effort with ultra short-throw optics that manage a 51-inch image within one metre. No word on pricing as yet. But this is premium clobber, so it won't be cheap! Also on Asus' IFA 2012 bingo card are some new-old tablets and a host of Zenbook laptops.